Extends any VGA/QXGA HD15 cable. Supports all VGA/QXGA monitors including analog flat panel display, high resolution desktop, CAD and graphic workstations. Extends any VGA cable. Supports all VGA monitors including analog flat panel display, high resolution desktop, CAD and graphic workstations. Design to protect the wear and tear of HD15 ports. It can also be used as extension cable. Ideal for extending your existing monitor connection replace the current cable or add more for multi-monitors. Extends any VGA/QXGA HD15 cable. Supports all VGA/QXGA monitors including analog flat panel display high resolution desktop CAD and graphic workstations. 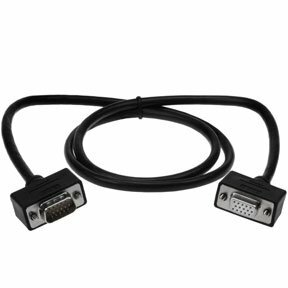 These VGA extension cables will allow for the extension of existing VGA cables or monitor connections. It comes in Plenum jacket, Ultra Thin Wire, regular jacket, and with ferrite. You can make HD15 Male to HD-15 female connections using these cables. The connections can be Shielded Plenum VGA, Ultra Thin VGA, or VGA. The cables are available in various lengths to cater to individual needs.